Click on The Preacher. All sermons may be viewed by going to the sermons page and having a look at the Overview of all Sermons. More on our series of messages with the theme; "Contemporary Issues"continues. This message was prompted by an article which I read in O Timothy magazine, Volume26-Issue3-March,2009. The article was a review of the Emerging Church movement which is gathering momentum around the world. In particular there were some comments from the Pastor of Mars Hill Church in Seattle, Mark Driscoll, which highlight the need for us to address the Contemporary Issues which we all face. What in the World is happening ??. We were privileged to have Brother W.L. 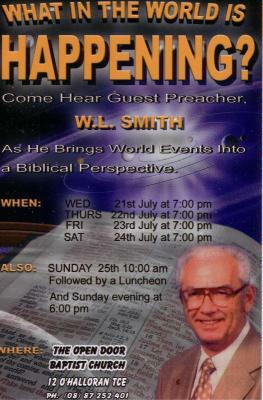 Smith as guest speaker, presenting a series of sermons relating to Prophecy in our times -The 21st Century. He has brought World Events into a Biblical Perspective. We would like to share His time with us and invite you to listen to the Sermons. "Economics in Bible Prophecy - Bro.W.L.Smith"
"God's People in Bible Prophecy - Bro.W.L.Smith"
"Moral Collapse in Bible Prophecy - Bro.W.L.Smith"
"Secularism in Bible Prophecy - Bro.W.L.Smith"
"Universal Effect on Creation in Bible Prophecy - Bro.W.L.Smith"
"Wars in Bible Prophecy - Bro.W.L.Smith"
We would appreciate your comment, input or story to add to our site. Tell us your story and how it has affected your life. If day to day pressures are troubling you and daily life seems impossible feel free to contact our Pastor. We value your input, Help us to present what you are looking for. Does Prayer and Fasting feature in your life. Check out these points on prayer and prayer and fasting. This is a sermon by Pastor Cotton which I believe truly puts it into perspective. Have you always been sincere in YOUR repentance of sin, or just a simple opps sory about that Lord or gee I didn't mean to do that Lord sorry. We must sincerely repent our errors and be truly sorry, not just half hearted and then probably do it again. "What is Repentance? - Pastor Cotton"
In order to listen to an excerpt from the Sermons just Click on the icon alongside the name or go to the Audio Sermons Page to download the complete Sermon. "Excerpt from God wants to use YOU - Pastor Cotton"
"Excerpt from Reminder about Hell - Pastor Cotton"
"Excerpt from Why Give Thanks - Pastor Cotton"
To present a website which offers to our readers the opportunity to hear a range of inspiring sermons, presenting the Gospel in a clear and concise manner enabling all to study The Word of God, of our Lord Jesus Christ and of Jesus Love for us. We are an independent Baptist Church located in Mount Gambier and use the King James Bible only in all our study. We often get emails which are interesting and/or funny, so please have a read. You will also find the profiles of some of the missionaries out there spreading the Word and bringing Glory to Our Lord. Every day it seems that we as Christians must be selective in what we read because it is very easy to be swayed by the name of some renowned writer. WE do become to an extent brainwashed or swayed by their popularity. The following item can explain some of the problems associated with the selection of good reading material.